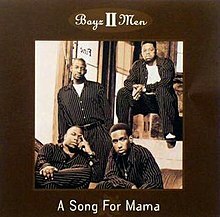 "A Song for Mama" is the title of a number-one R&B single by the American R&B group Boyz II Men. The tune, which was written and produced by Babyface, served as the theme song to the 1997 motion picture Soul Food, and spent two weeks at number one on the US R&B chart. To date, it is their last top 10 pop hit, peaking at number 7 on the Billboard Hot 100. The song also appears on the group's album Evolution. This page uses material from the Wikipedia articles "A Song for Mama" (contributors), and the Wikipedia article "Boyz II Men" (contributors), which are released under the Creative Commons Attribution-Share-Alike License 3.0. (1997) "A Song for Mama"
(1997) "Can't Let Her Go"